Remember back when you were a kid and dinosaurs were the coolest things ever? By the age of six, I decided I was going to be a paleontologist when I grew up. Dinosaurs capture our imaginations like nothing else does. The only problem was all we had when I was a kid were literally fossils and pictures. Then, in 1993, Jurassic Park was released on the big screen. It captivated audiences by showing us what we had never seen before, real believable dinosaurs in a movie. It also scared the crap out of you at times but that was part of the fun. Ever since that first movie, people wanted a game in which they could build their own Jurassic Park and fill it with their favorite dinosaurs. It would be 10 years after the 1993 release before fans would get their hands on a game like that. Jurassic Park Operation Genesis was released in 2003 and received pretty average reviews at the time. 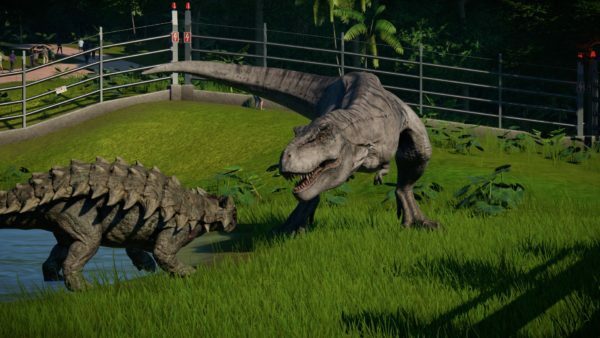 Its been 15 years since that original PS2/Xbox/PC classic and the developers over at Frontier Studios (makers of Planet Coaster) has given us a new addition to the Jurassic Park legacy with Jurassic World Evolution. 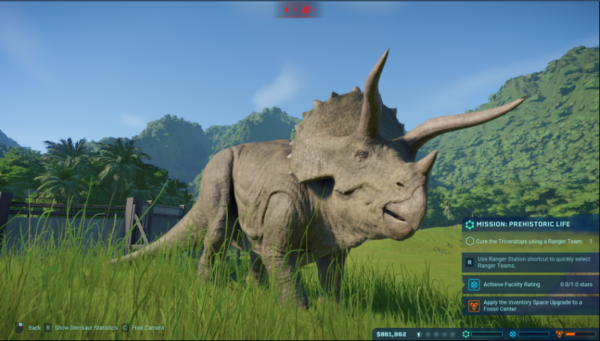 Jurassic World Evolution was released on June 12 and has been getting solid reviews. It has a mostly positive rating on Steam and its Meta Critic score is sitting at 71. Don’t let the average score fool you though, this game is packed with fun. 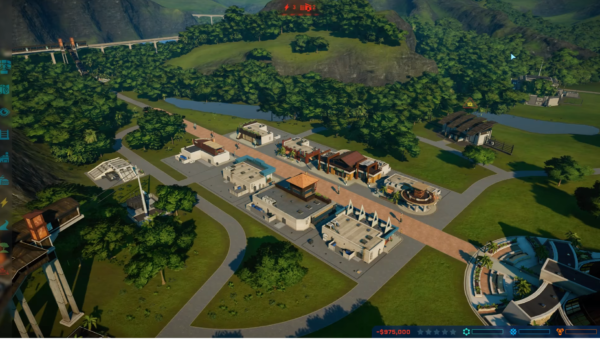 At its core, it is a Tycoon style amusement park management game – only with big awesome dinosaurs. Your job is to build facilities on a series of unlockable islands that all have their own specific challenges. On top of that, you need to go on expeditions to find fossils so that DNA can be extracted and used to create your dinosaurs. You also need to build enclosures to house them. The health and well being of your dinosaurs are also your responsibility. If they do get sick and you’ve already built a ranger station you can take control of the Jeep and administer medicine via dart gun. Jeeps are also used to re-supply feeders. 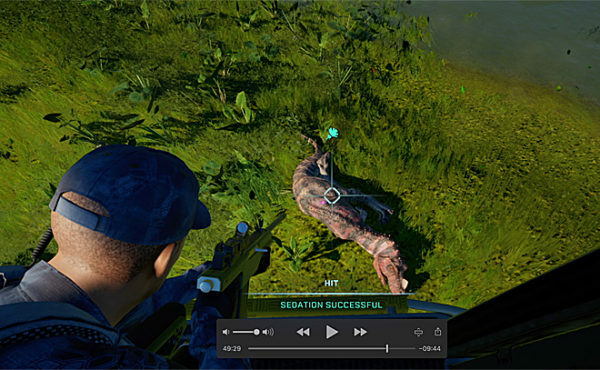 If your dinos decide they would rather break out and eat human this evening, you need an ACU (helicopter unit) to fly over and tranquilize the rampaging dino. Both flying the helicopter and shooting it with a tranquilizer can be done by you in the first person if you chose. On top of that, there are three advisors representing three different aspects of running the park: science, entertainment, and security. These all have to be relatively balanced because if one goes too far down in reputation it will sabotage your park. The way this is done is by doing contracts and missions for the three divisions. The challenge is, if you do a job for entertainment your reputation with security will go down and vice versa. Dinosaurs can be genetically modified to look different or to have sharper teeth, etc. and that is unlocked through the research center. Just when you think you are getting the hang of things you also need to keep a watch on your star rating which rates the overall satisfaction of the park, and oh, don’t go broke either. Now let’s take a look at the graphics and sound. First up, the game’s overall graphics are good. They don’t wow you but they’re solid with one major exception. The dinosaurs are incredible and look amazing. It is evident a lot of time and care went into making them. The buildings and foliage are pretty average but the fact that you can pilot the chopper and drive the Jeep make up for it. The sound, on the other hand, is top notch. Not only does it have that awe-inspiring score from the movies, but there are quite a few characters from the movies that are actually voice acted by the people who played them, including Jeff Goldblum himself. The dinosaurs sound great too. The gameplay can range from pretty mundane to absolutely hectic. When things go wrong they go wrong fast. Storms, sabotage, and bad management can all wreak havoc on your park. Making a profit can be challenging at first but like with any builder/management game once you get it down it’s pretty easy. Progression happens as you reach higher star ratings and do contracts and missions. This unlocks another island that varies in difficulty. On some islands you start with very little cash and the facilities are in disrepair, leaving you to dig your way out of a bad situation. One of the islands unlocks a sandbox mode that allows you to do whatever you like. There have even been reports of people conducting dino deathmatches, but I’m sure no one would ever want to know what would happen if a T-Rex ever did meet up with a pack of Velociraptors, right? That brings us to the most important and most overlooked aspect of the game and that’s it’s level of fun and entertainment. This is where Jurassic World Evolution shines. It is fun to go out on a dig and see if you get a new fossil or not. It’s fun to make habitats and care for the dinosaurs. Its fun to see how many people you can get coming to the park and it’s fun to release the occasional T-Rex on your patrons and watch them panic. The game gives you a progression system where you feel like you accomplish things while giving you the freedom to create. There are some criticisms of the game that some players have had. I don’t necessarily agree but I would be remiss if I didn’t bring them up. The first criticism people have is that the management system itself is pretty basic. It has all the essentials but seriously lacks in fine details like adding park benches or upgrading the look of buildings. Secondly, some players say its too easy. I hear this all the time with every single game that comes out so I don’t put much weight on it. If you want to play something difficult try Cup Head and let me have my fun with dinosaurs. Next, we have the ever-present crown jewel of whiny gaming nerds, it’s not as good as the original. I saw some reviews like this and it encourages me to look up what people were saying about the original at its release. Guess what, it had average reviews then too. This is definitely a case of looking at the past through rose-colored glasses. Lastly, there is a criticism of it just plain costing too much. I would agree that $60 for the digital deluxe edition that gets you all the dinosaurs is relatively high, but it’s no more than any other AAA game. I’m not sure why but sims like this do seem to come with a high price tag. All of that being said I really enjoy the game and encourage others to give it a try. Yes, it does have some faults. It isn’t a Civilization game or Planet Coaster. Whatever it may lack in complexity or difficulty it makes up for in accessibility. I play this game with my daughter and she loves it. That in of itself is worth the price tag to me. How many games out there can you play with a six-year-old and have as much fun as they are with it. Dinosaurs are still one of the coolest things of all time. They still captivate the imagination and bring the kid out in all of us. I have enjoyed every minute I’ve spent playing this game and I highly recommend it. Until next time, Happy RuneScaping.